Eye Lid Cleanser - from TheraLife Inc. - Get Dry Eye Relief! Eye Lid Cleanser - from TheraLife Inc. - Get Dry Eye Relief! Our Eye Lid Cleanser is a gentle, refreshing, soothing product for everyday eyelid and eyelash cleansing. It offers powerful control for serious conditions such as Blepharitis, Meibomian Gland Dysfunction, Meibomitis, Demodex, and Chronic Dry Eye Syndrome. Daily use can also help prevent these serious conditions from developing. It works by keeping your lids and lashes clean and free from debris and a wide range of microorganisms. 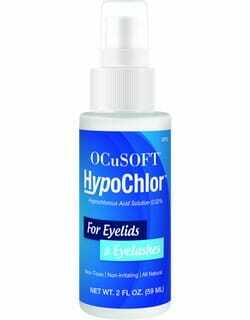 This natural formula contains pure hypochlorous acid (HOCl), which is naturally produced and released by neutrophil cells, part of the body’s natural defense mechanism against pathogens. This product contains no buffers, preservatives, or surfactants. Every Eye Lid Cleanser bottle contains 40ml. Use daily for optimum results.